The PHCPI Conceptual Framework highlights how the elements of strong primary health care come together to improve health outcomes. Some areas of the framework, however, are currently not measured by quantitative indicators available at the global or national level. These areas include some of the foundational capacities of primary health care; without being able to measure these areas, countries cannot develop a holistic understanding of PHC strengths and weaknesses, a critical first step in the measurement for improvement pathway. 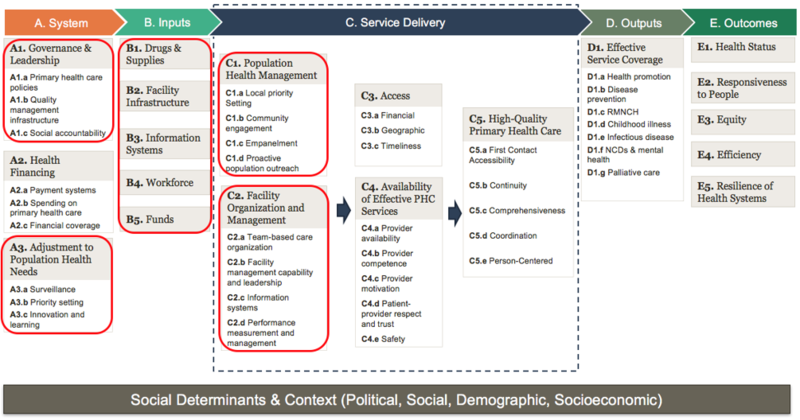 To systematically assess PHC capacity where strong quantitative indicators are lacking, PHCPI developed a mixed-methods assessment called the PHC Progression Model. The Model is designed to capitalize on the wealth of information, evidence, and data that is often available in countries but rarely captured in a way that generates usable information for decision-makers or is accessible to external audiences. The goal of the PHC Progression Model assessment is to bring together stakeholders who have varying and complementary knowledge of primary health care functioning in a country to yield an objective, comparable assessment of PHC capacity. The results of the PHC Progression Model are summarized in the "Capacity" section of the Vital Signs Profile and can be used by country leaders and development partners to identify strengths and opportunities for improvement in order to select relevant and targeted Improvement Strategies. The PHC Progression Model includes 32 measures to assess a country's capacity in the areas highlighted in the figure below. Each measure includes a rubric to assign performance to one of four categories, ranging from Level 1 (low) to Level 4 (high). The assessment is implemented through a joint internal/external evaluation exercise consisting of an internal self-evaluation and verification by an external evaluation team. The PHC Progression Model was piloted in five countries (Argentina, Ghana, Rwanda, Senegal, Tanzania) in 2018. Based on these experiences, PHCPI will be refining the Model to ensure that new global norms and best practices are reflected. If you are interested in partnering with PHCPI to complete a PHC Progression Model assessment in your country in the future or would like more information on the Model, please contact us at: info@improvingphc.org.